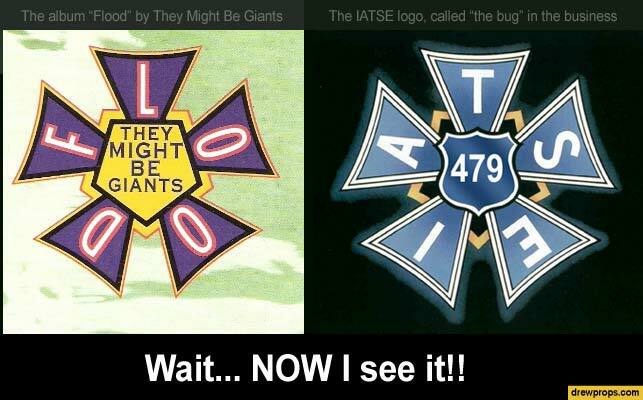 I worked in the motion picture industry for over a decade while listening to music by They Might Be Giants and never, ever noticed that the graphic “badge” on the cover of the album “Flood” is a barely reworked version of the IATSE logo (referred to as “the bug” by those in the union). I’m certain that there must be Wikipedia articles and fan sites devoted to plumbing the mysteries of the symbology of the album, so you probably ought to go there…. because if you came here looking for an answer as to WHY John Flansburgh and John Linnell (or their graphic artist) decided to use the bug on their cover, I’m as clueless as you!